The United States Congress designated the Wonder Mountain Wilderness (map) in 1984 and it now has a total of 2,201 acres. All of this wilderness is located in Washington and is managed by the Forest Service. 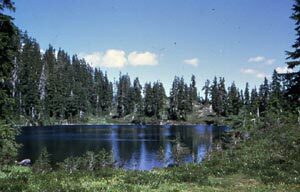 The Wonder Mountain Wilderness is bordered by the Daniel J. Evans Wilderness to the north. Located in the southeast corner of Olympic National Forest, little Wonder Mountain Wilderness extends south roughly in the shape of a triangle. A high ridge encompasses the southern point of the triangle, rising to the abrupt rocky peak of 4,848-foot Wonder Mountain. Below the summit, a heavy forest of western hemlock, Douglas fir, and silver fir reaches northward into the park. Within the Wilderness, the headwaters of McKay Creek and Five Stream emerge from four tiny secluded lakes, the only bodies of water in the area, that bear no names. A thick jungle of alder, willow, and vine maple grows along the creeks. A year's worth of precipitation sometimes reaches 60 inches, often falling as snow, and summer temperatures seldom top 80 degrees Fahrenheit. No trails cross this rarely visited Wilderness, nor do any trails lead to its boundaries. Two forest roads, that run relatively near the southeast and southwest borders, close to motor vehicles in fall and winter to provide protection for wildlife. Difficult hiking over steep forested slopes and along exposed ridges through tangles of huckleberry and thimbleberry will give you a Wilderness experience seldom surpassed in primitive solitude and exertion. Planning to Visit the Wonder Mountain Wilderness? How to follow the seven standard Leave No Trace principles differs in different parts of the country (desert vs. Rocky Mountains). Click on any of the principles listed below to learn more about how they apply in the Wonder Mountain Wilderness.